Wow, what a book! You may have thought you've read everything about the persecution of Catholics by the Third Reich before and during the Second World War. However, you are likely to be surprised by the memoirs of one of the great philosophers of the last century, Dietrich von Hildebrand. Von Hildebrand, who emigrated to the United States in the 1940s, died in the late 1970s. He was one of St. John Paul II's favorite authors. His writing has in recent years been reintroduced to a new generation through the efforts of von Hildebrand's second wife, Alice von Hildebrand (a well-known philosopher herself), and by the Dietrich von Hildebrand Legacy Project, spearheaded by John Henry Crosby, who co-edited this translation. This book is particularly accessible to a wide audience of readers, since it provides the inside story of one man's struggle at the risk of his life to combat Adolf Hitler and his Godless Nazi party. Although many Christians, both Catholic and Protestant, convinced themselves or allowed themselves to be convinced that it was possible to practice their faith without courting the kind of persecution that could deprive them of their jobs, land them in prison or work camps or cost them their lives, how wrong they were! Large numbers who bravely drew back from the line of accommodation they could not in conscience cross lost their lives like the Jewish victims of genocide in the concentration camps. This book takes the reader on a voyage with von Hildebrand from 1921 through the annexation of Austria in 1938 and then his escape from Vienna. The second part of the book is filled with his writing against Nazi ideology. 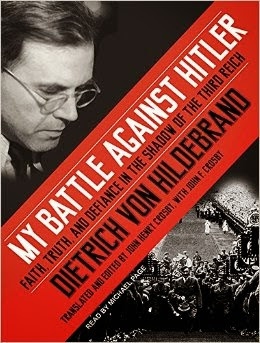 Hitler himself was very aware of von Hildebrand and his opposition to Nazi ideology. His ambassador to Austria wrote in Der Fuhrer, "The union for German liberation recently established here … seeks to overthrow the Nazi regime. … The mastermind behind these plots is well-known professor Dietrich von Hildebrand!" When von Hildebrand finally escaped from Austria with his family — with forged French passports — and made his way safely to New York City by way of Portugal and Brazil, even the FBI's J. Edgar Hoover knew of his anti-Hitler activities — not only in Italy, Germany and Austria, but also after his arrival in New York. This is a must-read; in my opinion, it would make a fine film about a truly great man who was called by Pius XII "the 20th-century doctor of the Church." And Pope Benedict XVI said of him, "When, at some time in the future, the intellectual history of the Catholic Church in the 20th century is written, the name of Dietrich von Hildebrand will be most prominent among the figures of our time." In addition, St. John Paul II called von Hildebrand "one of the great ethicists of the last century." The only question I have is: Why has this great man's cause for beatification not been started? Rev. C. John McCloskey is Catholic priest and author. This article first appeared on National Catholic Register.